All classic/vintage/military vehicles and vehicles of interest. Classes of vehicles include Vintage Cars, Classic Cars, Custom & Street rods, Military, Commercial and Motorcycles. We are looking for anyone who wishes to join us to celebrate our 21st show and exhibit their cherished vehicle. We are hoping that exhibitors old and new will join us to ensure the event is full and fun for all. Last years event saw us full!! with over 480 exhibitors and a record crowd of visitors all out in the sunshine to enjoy a beautiful day. There is plenty to see and do, with not just cars, but also Club Displays, an auto jumble to find that scarce part for your cherished vehicle. Whatever your interest you should be able to find it in Coleford. The Carnival is held on closed roads. Club and individual bookings are catered for on our website, as is a host of other information relevant information. Alternatively, view the Coleford Carnival of Transport Facebook page. 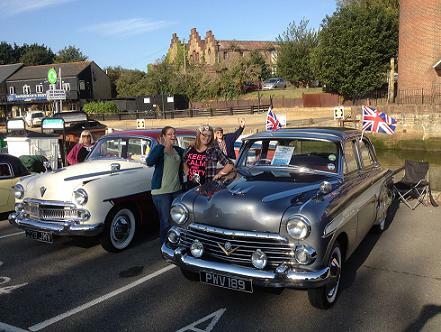 This is the 22nd year of The Coleford Carnival of Transport, exhibit and celebrate with us. The Coleford Carnival of Transport takes place on the streets of Coleford in the heart of the beautiful Royal Forest of Dean on Easter Monday every year . There is entertainment throughout the day, rides for the children, plenty of food outlets as well as an Art Exhibition , Craft Show and a Model Railway Exhibition.The Town Centre is closed so that vehicles of all types and periods can be displayed side by side.